Building on Jarrod Goldsmith’s extensive networking experience (and leveraging the whole ‘Fedora’ branding that he’s known for), he hosts a YouTube video series discussing a wide-range of networking/business tips that people find useful to help make their networking endeavors not only less stressful, but successful! 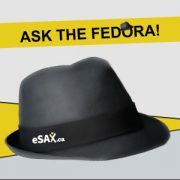 Feel free to subscribe to the eSAX YouTube account and follow via the @AskTheFedora Twitter account. This week our #AskTheFedora video looks at How To Interpret Body Language at Entrepreneur Networking Events! Of all the networking events I’ve been to, the one thing I’ve really come across is that picking up on body language is so important as a networking skill. Next time you’re at an event, look at the person, look at the way their standing, their tone of voice, if they are looking over your shoulder to see if there is anyone else in the room to connect to. What I’m paying attention to at a networking event is the non-verbal body language. Then you can adjust the way you talk to that person. If they are very shy, you don’t want to be in their face, you want to stand off to the side a little bit. 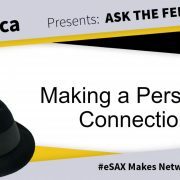 Because eSAX Makes Networking Work! Don’t forget to register for the next eSAX Ottawa Networking event! When networking, it’s always wise to AVOID certain topics!